We saw it on the evening news the same day of the event. The kids were pretty excited to have their moment on TV. I missed out since I was hunting pistachios in the car for hungry children. Check us out - it is quick so don't blink! When Ben is not doing well, it is an all consuming task to figure out what to do. And when things are good, everything seems brighter. For the past three weeks, Ben has been sleeping and eating well, walking with his walker and alert. "He's Back" was my second choice for a post title. Ben is back in full form - silly personality, sneak attacks and mischievous behavior. I will take it all - over the drugged out boy of a few months ago. The cause for these changes - medication. We have made just a few adjustments and they are working. In the meantime, we did have Ben's blood sent to a lab for genetic testing. Supposedly, it could tell us more about his seizure disorder and help in choosing the best medications for Ben. Right now, we will ride the high; enjoy a fun and wild summer, taking the boys swimming and hiking, going on road trips and playing disc golf. 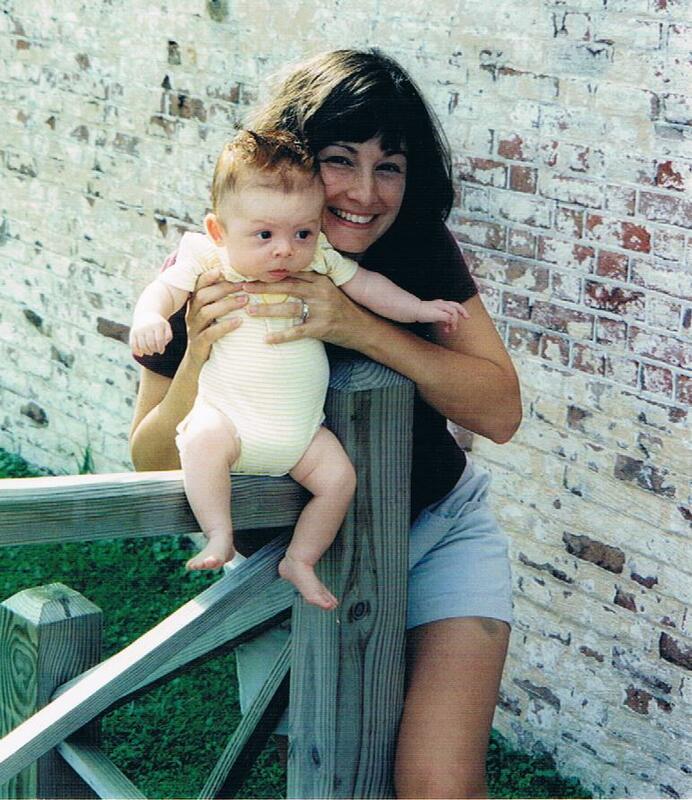 I take it all week by week, appreciate these easy times and keep my eye on the red head - because he is a tricky one! After many speakers (in 95 degree heat) the home plate was set in place, and then we were served the proper baseball meal - hot dogs, Cracker Jacks, Babe Ruth chocolate bars and chips. The field will be made of a hard rubber surface, perfect for wheelchairs and walkers. Games last about an hour, with just 2 innings played (I said a silent thank you when I heard that.). Each player has a buddy who is at least 12 years old. All players get to bat and it seems that the last batter always gets a home run. The focus is on meeting other families and making friends - baseball is just the medium. Homer, the mascot for the Charlotte Knights Baseball Team, was in attendance. 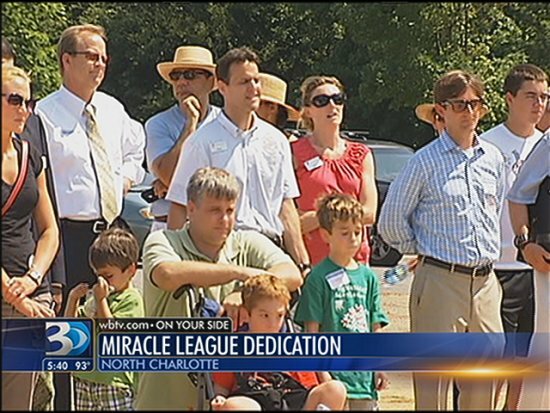 The team's owner, Bill Allen, has a strong interest in Miracle League. 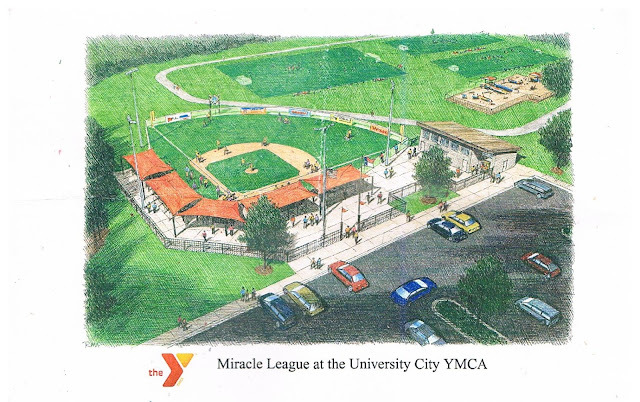 Along with the YMCA's support, this could become a great outlet for families with special needs and help build awareness about disabilities through volunteers and sponsorship. There was already mention of building more fields throughout Charlotte. Ben is registered to play on opening day - September 8. Rainbow Express is sponsored by a local church. I do not know how long they have been sponsoring this camp, but the model they use works. 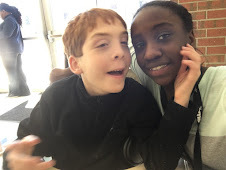 Each camper (special needs child) has a buddy (typical developing child, same age as camper) and a teenage counselor. They spend the week together playing, worshipping and becoming friends. Each day is jam-packed with arts & crafts, park visits, dancing, singing and always ends with a custom-made puppet show. Roughly 75 campers participate - so this is no small group. The youth of this church plan and execute this camp. They spend a large portion of their year planning for this week. Although adults volunteer and help during the week, the majority of the program is completed by the youth. The theme this year was "Be Strong," taken from Ephesians 6:10, "Be strong in the Lord and His great power." The entire church was turned into a castle. The week is always a reunion - everyone wants to see their past camper, buddy or counselor. Parents meet up and have coffee to catch-up on news. Stress is low, connections high. This week, when I pick up Ben at the end of a 6 hour day, he pushes me away. He wants to stay longer. There is no shortage of love, hugs and warmth in the church gymnasium - who wants to leave that? From the backseat of the car, the question "Mom, what's your weakness?" was thrown at me. My first reaction was to figure out from where this question was coming. Then I remembered the Superheroes, Comics and Star Wars books, toys and movies at our house. Each characters' weakness is key to their story. Then I responded with, "I am not great with crisis." Of course, that answer was met with a "What's crisis?" I explained that when unexpected drama that especially included blood, guts and gore entered a situation, I needed assistance. They asked about their Dad's weakness, and I told them that he would have to answer for himself. Rather big of me, I have to say. The boys talked about their own weaknesses and then we discussed how important it was, in life, to understand your own weaknesses - know what you are good at and know what things you may need help with. My brain pondered this topic all day (and still keeps going) - What are my weaknesses? Handling crisis is just one - what are my others and how do I compensate for them? Do I ask for help? Is life easier knowing my weaknesses or is it better to gloss over them, pretending they do not exist? How are my weaknesses perceived by others? Do others see the same ones I do? Do I have blindspots? That night, Logan and Sean crawled into bed with Ryan and popped their question to him. I was sure his response would be paperwork, procrastination, directions...I had many on my list. Fourteen years of marriage provided me enough experience for a good solid list. As usual, Ryan had the best answer. He said, "My boys." Logan shared this with me, and added with a knowing smile, "I think I understand." Perhaps one day he will. tight to your perspective, or try a new one. I was not around when this was taken so when it popped up on the screen when I was downloading photos, I had to stop for a moment to collect myself. Then I noticed the brakes on the big wheels. At first glance it looks like Ben is taking the ride of his life. Brakes or not, isn't he? As of March 2012, hotels were expected to comply with a set of ADA requirements. The pool and Jacuzzi, as well as bathrooms and other areas must be accessible. Many had a hard time meeting these requirements and a 60-day extension was given to the hotels. I fell into this information after booking a room through Priceline. After I booked online, I noticed the hotel's website mentioned ADA so I called to ask for a room with an accessible bathroom. Usually a handicap room means extra space in the room and bathroom. The hotel staff explained that I was able to get two adjoining rooms for the one price I already paid through Priceline. The room with the king size bed would be equipped with a handicap bathroom. When we arrived at the hotel, the staff was as helpful as they were on the phone. I was worried that this dream was too good to be true. I thought for sure, I was going to get slapped with a bill. However, we received the two rooms without an extra charge. The space was helpful in many ways. The bathroom had railings everywhere, was large and it was easier to maneuver Ben around. In addition, Ben's sleeping is crazy again and the extra room made a difference for us. Next time you book a hotel, ask questions about what is provided in terms of accessibility. By law they may not charge you for the extra room IF they only have king size beds with a handicap bathroom and you need two beds in the room. This is a loop-hole right now. As new hotels are built, they will provide handicap bathrooms with two beds. Some hotels may already have this option, you just have to check first. ** And we stayed at Holiday Inn using Priceline Name Your Own Price. I highly recommend both.